Sometimes there just isn’t a good explanation for a cancer diagnosis other than random bad luck. That’s what researchers at Johns Hopkins have found. In a study published Thursday in the journal Science, oncologist Dr. Bert Vogelstein and biomathematician Cristian Tomasetti link more cancers than previously thought to random DNA mutations, and not to heredity or environmental factors. Their analysis reveals a strong correlation between the total number of divisions that naturally occur in a tissue over its lifetime and the risk of getting cancer in this tissue. So, the greater number of divisions, the higher the risk of developing cancer in that tissue. The two looked at rates of cell division among 31 types of tissue. They found that 22 of the types, including pancreatic, bone, ovarian and brain cancer, are often affected by these random divisions. But the researchers warn that this new analysis does not mean that people should ignore other factors that could contribute to developing cancer. Tomasetti said, for instance, it is well known that smoking carries a huge risk for lung cancer, so it depends on the tissue. 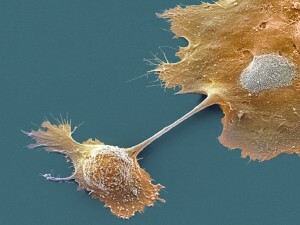 The pair did not look at breast cancer and prostate cancer, because there are not reliable estimates for the rates of those tissues’ cell divisions. To learn more about this study, we talked to co-author Cristian Tomasetti. NEWSHOUR: Cristian Tomasetti, thank you for joining us. So what’s new here? CRISTIAN TOMASETTI: We know that cancer is due to three main factors: the environment — things like smoking, environmental factors; those that are genetically inherited; and then the third factor is just pure chance. And the pure chance is due to our cells and our tissues that divide. And some tissues divide very frequently. Every time you have a division, there is a small possibility that a mutation will occur in our DNA. And if it happens in the wrong gene, this may take us to cancer. So what this study did — we analyzed: What is the role of bad luck among all the components? And it turns out that it plays a key role. It’s responsible for what we estimate to be two-thirds of the variation of cancer risk across tissues in humans. NEWSHOUR: This really goes against what a lot of people think — that it’s more about hereditary and environmental factors. So changing lifestyle habits isn’t as important in preventing cancer, according to your study? CRISTIAN TOMASETTI: No, no — it is absolutely important. Let me make an example. Say, if it was true that it was only due to environmental factors and inherited genes leading to variation — then let’s say my parents smoked all their lives and never got lung cancer. Then that may say to me, their son, that I can also smoke because I got very good genes inherited from my parents. To the contrary, what this study is saying is that this is wrong and that my parents were just particularly lucky and played a very dangerous game, and that it would be irresponsible of me to play the same type of game. It emphasizes the importance of doing what we can to reduce those factors that are increasing my risk. Also, another element to keep in mind is that when we say “two-thirds” — it’s an estimate looking across many, many tissue types. So there is, of course, an important variation among tissues. For some tissues, like lung cancer, it’s very well-known that smoking has a huge risk of getting to that type of cancer. So it really depends on the tissue, too. NEWSHOUR: Why did you decide to exclude breast cancer and prostate cancer? CRISTIAN TOMASETTI: We studied 31 tissue types. And what you asked is very important because breast cancer and prostate cancer — those are two very, very important cancers with extremely high incidence. The reason why we had to leave them out is that we didn’t feel that we had reliable enough estimates for how many stem cell divisions occur in those tissues in a lifetime. And to simply explain the basic idea — tissues like colon undergo divisions that, say, renew every five days or basically a week. So there is very high renewal, and it’s pretty linear in time. While in tissues like breast, the renewal, the cell division, it’s highly dependent on our hormonal levels and age, so we were not able to find estimates that we felt were reliable enough to give us a number that would have allowed us to do an analysis for those tissues. NEWSHOUR: Which tissues did you find more prone to this random bad luck? CRISTIAN TOMASETTI: There are tissues like colon cancer or skin cancer, where it is clear in our analysis that the impact of the environment is huge, as are inherited factors. And then there are tissues that don’t seem to have a large component of those factors — where it looks like, at least for our population, it’s a lot of just bad luck. Some of those tissues, just to name some names, are the small intestine or some of the brain cancers. Bone cancer is another very important one. NEWSHOUR: And what would you say is the takeaway when it comes to finding and treating cancer? CRISTIAN TOMASETTI: I think that the main takeaway is that we should probably focus more resources and research on finding ways to detect cancer at very early stages. Because for some tissues, where luck is the main component, there is not a lot you can do by just using primary prevention — which means vaccination or changing our lifestyle or diet or quitting smoking. There are cancers where those things will not be as effective as for other cancers, like lung cancer. Therefore, for those tissues, probably the best thing is to focus on early detection.